Nina Ricci, fall/winter 2001-02 collection designed by Nathalie Gervais. L'Air du Temps, 1948, Capricci, 1961, Farouche, 1974, Signoricci, 1975, Fleur de Fleurs, 1980, Nina, 1987, Ricci-Club, 1989. Awards: Mme. Ricci awarded Chevalier de la Légion d'Honneur; Fragrance Foundation Hall of Fame award, 1982; Fragrance Foundation Perennial Success award, 1988; Dé d'Or award, 1987; Bijorca d'Or award, 1987, 1988; Vénus de la Beauté, 1990; Trophée International Pardum/Couture, 1991; Prix d'Excellence "Créativité" 1992; Trophée de la Beauté de Dépêche Mode, 1992; Prix Européen de la P.L.V., 1992; l'Oscar du Mécénat d'Entreprises, 1993. Company Address: 39, avenue Montaigne, 75008 Paris, France. Guillen, Pierrre-Yves, and Jacqueline Claude, The Golden Thimble: French Haute Couture, Paris, 1990. Pochna, Marie-France, Nina Ricci, Paris, 1992. Carter, Ernestine, "The New Boys at Nina Ricci," in the Sunday Times Magazine (London), 15 December 1963. Morris, Bernadine, "Robert Ricci, Couturier, 83, Dies…," in the New York Times, 10 August 1988. Davy, Philippe, "Le charme romantique des succés de Nina Ricci," in L'Officiel (Paris), February 1990. Deeny, Godfrey, "Ricci's Pipart: Staying Power," in WWD, 26 January 1995. White, Constance, C.R., "Refreshing Nina Ricci," in the New York Times, 25 April 1995. "Nina Ricci Gets Luminous," in Cosmetics Products Report, September 1999. "Guest Amenities," in Hotel & Motel Management, 20 September 1999. Sulic, Diana, "Nina Ricci," [profile] online at Fashion Live, www.fashionlive.com , 5 August 2000. Deeny, Godfrey, "From Russia with Ricci as Designer Bows Out," available online at Fashion Windows, www.fashionwindows.com , 10 March 2001. Patterson, Suzy, "Luscious Furs and Fabrics at Nina Ricci," available online at www.theage.com.au , 12 March 2001. To make women beautiful, to bring out the charm of each one's personality. But also to make life more beautiful…that has always been my ambition, and that is the underlying philosophy of Nina Ricci. 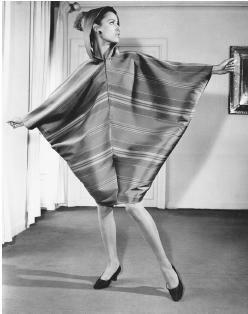 Nina Ricci, fall/winter 1966 collection: "El Moroco," a North African-inspired cocktail djellaba. Nina Ricci is established as one of the longest running Parisian couture houses. Unlike her peers, Elsa Schiaparelli and Chanel, Ricci's reputation does not rest on a revolutionary fashion statement. Instead, she was successful because she provided an understated, chic look for elegant and wealthy society women, always classic, yet intoxicatingly feminine. When it came to designing clothes, Nina Ricci relied greatly on her feminine intuition. She worked directly on the model and designed by draping the actual fabric, which she felt gave her the answer to what the dress would become. Creating clothes was simply a matter of solving problems and in the 1930s she described several of them—she had to find an extra special, elegant detail that would render a dress a client's favorite and achieve a maximum ease and lightness that did not encumber the wearer when moving or dancing. Much of the detailing in Nina Ricci clothing reflected the designer's ultrafeminine approach, the flattering effects of gathers, tucks, and drapery and an attention to décolleté and figure-hugging details like fitting dresses below the waist. She was clever and original in her use of fabric, cutting plaids and tartans on the bias for evening dresses and a black silk border print fabric so the print was avidly displayed over the bust, leaving the rest of the dress to become a straight column of fabric. Ricci had been a successful designer for other houses before she decided to open her own with her son Robert in 1932. At the age of 49, this could have been a risky venture but the gamble paid off as the company rapidly grew in size and stature during its first decade. By 1939 they occupied eleven floors in three buildings, a stark contrast to their humble beginnings in one room at 20 boulevard des Capucines, Paris. Nina retired from the business in the early 1950s, leaving the field open to her son Robert who pursued his own ambitious plans for the house. An excellent businessman, Robert Ricci established many divisions and licensees for the Ricci name. A fragrance, Cœur de Joie, was introduced in 1945, followed by the now classic L'Air du Temps. Later such fragrances as Fleur de Fleurs, and Nina were successively marketed. Sunglasses alone were reported to be grossing $6 million in the late 1970s and by 1979 the house had become firmly established in the former Kodak Mansion, opposite the House of Dior on avenue Montaigne, Paris. Robert Ricci had also been successful in his choice of designers for the house. Belgian designer Jules-François Crahay was named head designer in 1954 and made his debut with a collection paying homage to Nina's trademark feminine look. Carrie Donovan from the New York Times described it as "a collection that was feminine in the extreme—beautiful of coloring and fabric, unbizarre and elegant." Crahay was succeeded in 1963 by Gérard Pipart, who remained as designer of both the couture and boutique collections for 30 years. After Pipart, there was a succession of designers, including Christian Astuguevielle and Myriam Schaeffer but the label had fallen out of favor with young Parisians. Canadian Nathalie Gervais, formerly of Gucci and Valentino, was brought in in 1999 to reinvigorate the Nina Ricci name. Her luxe and trendy designs, along with a flashy new ad campaign, put the label back on solid ground. 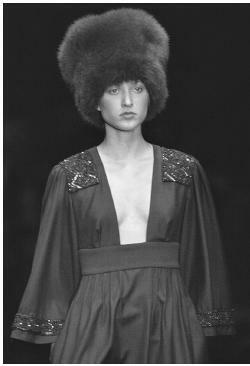 Gervais' early 2001 collection did not disappoint; her Indian and Russian-inspired collection featured slim pants, slinky tops and tunics, and leathers and furs. In the 21st century Nina Ricci remains best known for its fragrances, especially the enduringly classic L'air du Temps, as well as a growing number of other fragrances and skincare products. Its haute couture, however, has struggled to maintain its identity. Nathalie Gervais seemed to have captured and updated the elegance long associated with the Nina Ricci name, then stunned the fashion world by announcing her departure from the venerable house in 2001. Nina Ricci was once again looking for a designer left by the void of longtime trendsetters Crahay and Pipart.